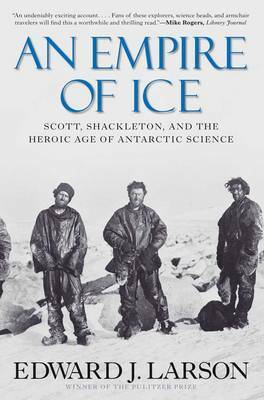 Published to coincide with the centenary of the first expeditions to reach the South Pole, An Empire of Ice presents a fascinating new take on Antarctic exploration. Retold with added information, it's the first book to place the famed voyages of Norwegian explorer Roald Amundsen, his British rivals Robert Scott and Ernest Shackleton, and others in a larger scientific, social, and geopolitical context. Efficient, well prepared, and focused solely on the goal of getting to his destination and back, Amundsen has earned his place in history as the first to reach the South Pole. Scott, meanwhile, has been reduced in the public mind to a dashing incompetent who stands for little more than relentless perseverance in the face of inevitable defeat. An Empire of Ice offers a new perspective on the Antarctic expeditions of the early twentieth century by looking at the British efforts for what they actually were: massive scientific enterprises in which reaching the South Pole was but a spectacular sideshow. By focusing on the larger purpose, Edward Larson deepens our appreciation of the explorers' achievements, shares little-known stories, and shows what the Heroic Age of Antarctic discovery was really about.